Record Reproduction Services is a medical record retrieval company founded in 1994. Their primary services is release of information for medical providers. They also offer storage, audit support, scanning, conversion and document procurement services. RRS is located outside of Philadelphia in Media, PA.
RRS clients can have medical records delivered as electronic documents encrypted on CD-ROM. The existing process involved off the shelf CD authoring software that was slow and buggy. Operators had to select documents for processing, create the CD-ROMs, print cover letters and labels and finally assemble the package for mailing. This multi-step process increased the risk of human error. RRS needed to revamp the entire system to shorten document delivery time and increase accuracy. Vega staff worked with RRS to develop a custom CD-ROM authoring solution. 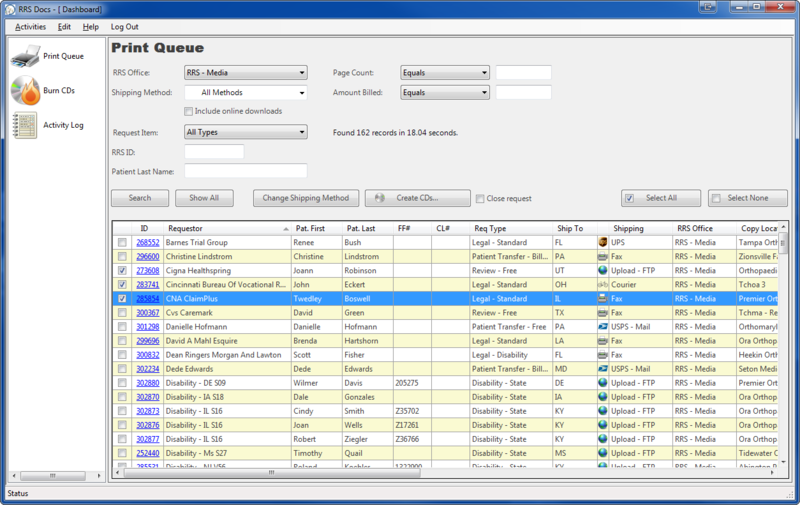 The .NET application hooks into the existing document tracking database to see which documents are queued for delivery. The system separates CD-ROM content preparation and CD-ROM creation into different tasks. This way multiple operators can run the system at once. The entire application is built with Microsoft .NET 3.5. The front end is a WinForms application developed with VB.NET. Other components such as the data access layer and the low level CD-ROM interface were written in C# and the Win32 API.